It’s a whole new world now that I’ve discovered the glory of the propane weed burner. I must caution you that this can be addictive and habit forming. I’ve done RoundUp, manual pulling, as well as the vinegar/salt/soap concoction. All work fine, but nothing offers the shear satisfaction of watching once proud weeds shrivel into nothingness like the Wicked Witch of the West. The process to begin the incineration of parts of your property is quite simple. I found a scorching hot bargain at my local Harbor Freight. They offered 2 kinds: one with the push button ignitor on the handle ($29.99), and one without ($19.99). This is the one that I bought and am using in the video below. If you go to Harbor Freight, tell them “some guy on YouTube with an alpaca farm sent me”. I’m sure they’ll cut you a deal. Reducing weeds in our sidewalk and driveway to ashes has proven to be overwhelmingly satisfying. Consequently, is easy to get lost in the song of the burning torch as you scorch dandelions, toast crabgrass, combust cockleburs, broil broadleaf, and singe the occasional leg hair. As a result of the burning, the driveway has never looked so good. Because this activity can be so cathartic (and it is) it can also mess with your head. Walking through the neighborhood with my lovely wife this past weekend, I kept looking at the weeds and the cracks of the sidewalks saying, “I wanna burn those so so bad right now”. The word on the street is that this is also a good thing to do to the alpacas’ poo areas to control parasites. I’m gonna start doing that as well. 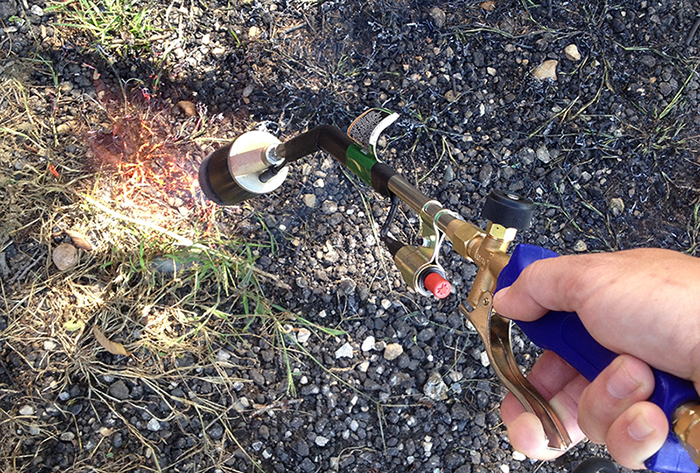 Now that I have some experience with this, it is best to simply heat the weeds until they begin to wilt. They will be dead the next day. If you burn them away completely, they will grow back.